Over time, a model of planting Spanish-speaking churches has emerged. 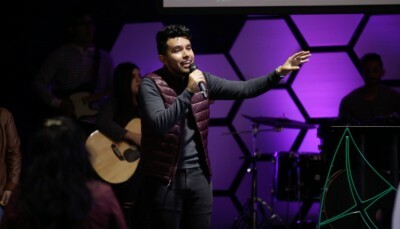 Often English-speaking congregations are drawn to the prospect of partnering with a Spanish-speaking church as a missional means to touch a demographic otherwise beyond their reach. In doing so, the Spanish-speaking church uses the building owned by the English-speaking church to conduct worship services. When the Spanish-speaking church gains traction and becomes self-sustaining, they may then choose to purchase their own facility. At that point, the relationship between the two churches can somewhat cease to exist, though it may never have truly materialized in the first place. 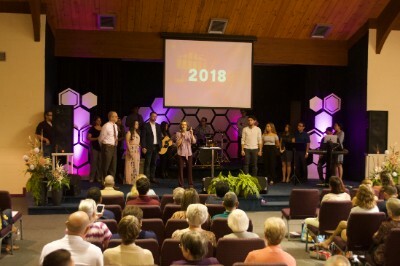 Tampa, Florida’s English-speaking Oak Grove Church of God and the Spanish-speaking Arbol de Vida have decided to do things differently. Reflecting their heart’s desire to be one church with two cultures, they’ve united at (the) Altar. In the history of the two congregations, there has always been a prevailing sense of unity. Sure, there have been a few bumps in the road, but the pastors learned to get along very well. When the planters of the Hispanic work transitioned out and a new pastoral family was welcomed in, instead of complicating matters, it only fostered further growth and connections between the English- and Spanish-speaking congregations. 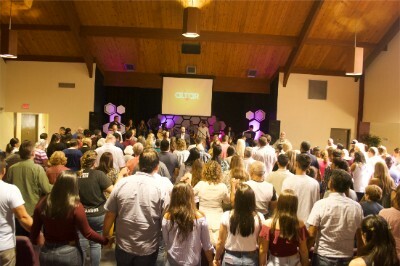 Spanish- and English-speaking believers joining hands at Altar. God’s pattern throughout Scripture is give a new name after he’s made an important change. They could not continue with two different names, signaling two separate churches. They had to come up with a way to communicate to the congregation and the community the oneness God had given them. So, the two groups met at (the) Altar. In Florida, across North America, and around the world, the Church of God is taking back what hell has stolen. Join the movement. Give life. Donate today at give.jesusisthesubject.org. This entry was posted in All Church of God, Give Life, Southeast and tagged Altar, Arbol de Vida, community, cross-cultural, English, FL, Florida, Hispanic, Iglesia de Dios, innovation, Jonathan Frymire, Karen Kier, language, linguistic, multicultural, Oak Grove Church of God, oneness, outreach, Spanish, strategy, Tampa, Tato Caballero, unity. Bookmark the permalink.